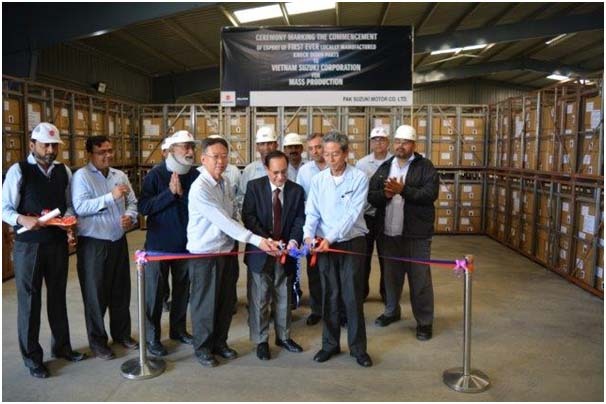 Pak Suzuki Motor Company Limited achieved yet another milestone for being first in the history of automobile industry of Pakistan to commence locally manufactured Knock Down (KD) parts’ export operations to Vietnam Suzuki Corporation for mass production of Suzuki mini-truck model. In this regard, a ribbon cutting ceremony was held at Pak Suzuki Motor Co. Ltd., Bin Qasim Plant, Karachi on 09th January, 2017. Mr. Hirofumi Nagao, Managing Director and CEO of Pak Suzuki and Mr. Abdul Razzaque, CEO of M/s. Metalline Industries were chief guests on that occasion. The 1st ever locally manufactured knock down (KD) parts’ exports consignment was shippedby sea from Karachi International Container Terminal (KICT) on 20-Jan-2017. This step by Pak Suzuki will further contribute towards the national economy in the form of foreign exchange revenue. Pak Suzuki is already among the top list of OEMs contributing a substantial amount in terms of duties and taxes towards the national ex-chequer. Pak Suzuki has plans to further enhance the export market operations for locally manufactured knock down parts.